First TransPennine Express has unveiled the first advertising campaign to offer live train times on digital screens at Manchester Airport. 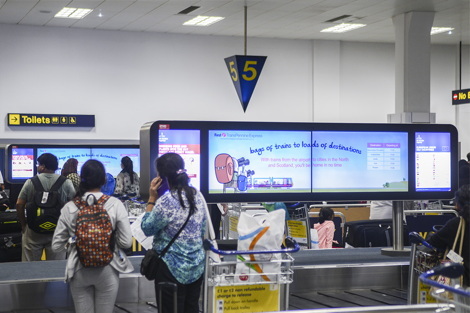 The campaign by UK airport advertising specialist Eye Airports enables arriving passengers to view their next train to a wide range of destinations. It also reminds travellers that First TransPennine Express services are a quicker and more cost-effective way to get to and from the airport than using cars or taxis. Featuring First TransPennine Express’ fun, colourful brand characters, the campaign appears on Eye Airports’ lightbox and digital six-screen advertising sites, which are seen by passengers as they walk from their flight to the baggage reclaim hall. Once at baggage reclaim, up-to-the-minute information from the national rail database is shown on the digital arrivals gallery screens. A programme has been designed to allow enough time for passengers to walk to the station and catch the train after collecting their bags. The screens also prompt passengers to save time by downloading the First TransPennine Express app to buy tickets and check train times from their mobile device while waiting for their bags. Caroline Anchor, Head of Marketing at First TransPennine Express, said “Taking the train from Manchester Airport is a quick, convenient and relaxing way to complete your journey using our regular and comfortable services to destinations across the North West, Yorkshire and Scotland. Eye Airports’ national network reaches 100 million passengers a year. Last year it announced its #RedefiningAirports project, an £8m investment in advertising media and technology, the largest investment in advertising in UK airports this decade, involving the latest high-spec formats and opportunities for advertisers to “dominate” the airport environment. This entry was posted on Thursday, August 27th, 2015 at 15:20 @680 and is filed under Scuttlebut. You can follow any responses to this entry through the RSS 2.0 feed. You can leave a response, or trackback from your own site.